This was quite interesting. Can you tell me how those at COMBLE answered that question? When IS a university (or in my case, I am wondering about secondary levels like HS) ready for blended learning? What are your thoughts on blended learning as an efficiency strategy, and personalized learning method? When it comes to BL as strategy I actually find it hard to envision an institution or a company without it. But there are degrees of blending, and if one were working with a group of teachers/trainers that are not particularly tech savvy I would definitely recommend a slow start with a few well-chosen tools. Furthermore I think successful implementation depends very much on pedagogical culture and alignment with pedagogical ideas. In my experience unsuccessful implementation of new tools not only stems from poor understanding of the tools, but just as much poor understanding of the pedagogical practice! 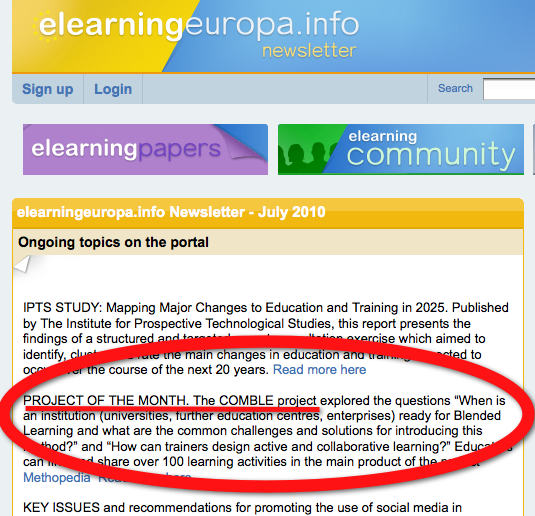 Being a teacher, I allow myself to say that ;-)Depending on pedagogical foundation BL could were well support a personalized learning method – that’s also why we, in our course in the project, chose Problem-Based Learning – working with real-life problems seems to appeal to most learners regardless of age … But what is your experience? Thanks for that reply. I’d like to talk to you about this further, as I am writing some research about blended learning and can really use some insight from experts like you. My experience is just as a journalist and in the observation mode. I found that many corporations, like Canon USA, Northrup Grumman, and others have used blended learning as a very good stepping stone to an educated sales force, or in creating knowledgeable employees during transition, promotion, etc.